JAKARTA, Indonesia (CNN) -- At least 1,100 people are dead in Indonesia as a result of two large earthquakes in as many days, United Nations humanitarian chief John Holmes told reporters Thursday. 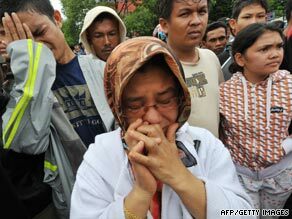 Family members mourn in front of a collapsed school in Padang on Thursday. Hundreds more are believed to be injured, Holmes said. "These numbers, I fear, will rise as more information becomes available," he said. "It's still feared that thousands of people are trapped under damaged houses and many buildings." Telecommunications are difficult into the region, roads are cut off and the hardest-hit area, including the city of Padang, lacks power and other services, Holmes said. Heavy rainfall also has hindered search and rescue efforts. Corpses lay stacked outside hospitals in Padang as night fell Thursday, casting nearly the entire city in darkness. The 6.6 magnitude quake Thursday hit South Sumatra (9:52 p.m. Wednesday ET), about 100 miles (160 km) from Bengkulu, the U.S. Geological Survey said. An earlier quake Wednesday had a magnitude of 7.6. Worst hit was the West Sumatran capital of Padang, where officials estimate 376 people perished. Rustam Pakaya, the head of the Ministry of Health's crisis center, said thousands of people may be trapped by collapsed buildings and houses. Officials say casualties could surpass those of the massive Yogyakarta earthquake three years ago, given the intensity and the spread of the damage this week. The second set of tremors Thursday only magnified the scope of the disaster. In May 2006, a 6.3 magnitude quake centered in the central Java city of Yogyakarta killed more than 5,000 people and triggered fears of an eruption of a nearby volcano. Two quakes in one day - coincidence? On Thursday, many people were wandering the streets of Padang "stunned and dazed," said CNN's Mark Phillips. Some were searching the rubble for survivors, he said, but "there's also a feeling that there aren't that many survivors left." Wednesday's quake reduced buildings to rubble in Padang, a city of nearly 1 million. People used hammers, chisels and bare hands to dig through debris. Staff at a local hospital treated the injured outside the semi-collapsed building as bodies lay in makeshift morgues. The earthquakes caused widespread power and phone outages, making it difficult for authorities and aid organizations to evaluate damage. Thursday evening, the only light came from generators at Padang's hospital and airport. Several of the hospital's buildings were severely damaged, said CNN's Dan Rivers. Damage in the town itself was spotty; some buildings remained intact near others in ruins. In Padang, thousands of people slept outside Wednesday night for fear of more tremors, said Yenni Suryani of Catholic Relief Services. She said rain fell Wednesday night and people are in desperate need of adequate shelter. Amelia Merrick, the operations director for World Vision Indonesia, described the situation as "quite devastating." "Bridges have gone down, phone lines are in total disrepair," she said. "It's difficult for us to assess the situation." Wayne Ulrich, the Red Cross disaster management coordinator in Indonesia, said hundreds of houses were damaged, the extent still unclear. "We have concerns that a hospital has been partially damaged; a market has caught on fire; the airport was closed down for inspection because of the fear if they landed any planes" it might cause problems, Ulrich said. He said access to the impacted areas was obstructed in parts. Wednesday's quake was felt in nearby cities including Medan and Bengkulu, where people panicked and ran outside in search of higher ground, fearing a tsunami. But it was also felt as far away as Singapore and Malaysia. "I did feel the tremor in the office today somewhere between 5 and 6 p.m.," said Ratna Osman, who works in a single-story office building in Petaling Jaya, just outside Malaysia's capital Kuala Lumpur. "I asked [a co-worker] if there's an earthquake somewhere -- either that or I was hallucinating. "At first, I thought the chair I was sitting on had a screw loose or something," Osman said. The region is accustomed to earthquakes, and locals have been taught to identify safe places in case of a tsunami, according to Sean Granville-Ross, the Mercy Corps country director for Indonesia. "We hope that preparation is now paying off," he said. Earlier this month, an earthquake in West Java killed 57 people. The Web site for one of Indonesia's main newspapers, The Jakarta Globe, crashed for a while, partly as a result of the heavy traffic from people trying to find out about the quake, the paper said in a Twitter post. Aid agencies kicked into gear to help those in need. "We had aid ready because this area of Indonesia is susceptible to this type of tragedy," said Jane Cocking, humanitarian director for Oxfam. "Communications with the quake-zone are difficult, and we are hoping for the best but having to plan for the worst." CNN's Andy Saputra in Jakarta, Indonesia, and Tricia Escobedo in Atlanta, Georgia, contributed to this report.